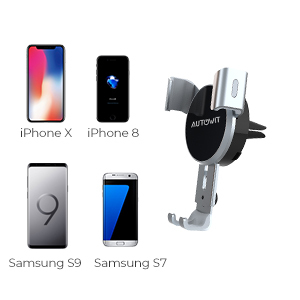 Autowit Wireless Car Charger is powerful enough to fast charge compatible phones and clip into your air vent so your view of the road is unobstructed. The gravity-based clamps allow making it ridiculously easy to get your phone in and out while still keeping your phone secure while you drive. 【Fast Charging】Upgraded charging coil makes it available for quick charging which charges up to 40% faster than standard charging. 【One Hand Operation】Just put on your phone, the car charger holder will clamp automatically according to smart gravity linkage and align the phone with wireless charging sensor. 【Qi Compatible】Compatible for all Qi-enabled devices; 7.5W for iPhone X / 8 / 8 Plus, 10W for Samsung series and more, 5W for Galaxy S6/S6 edge, LG, Lumia, HTC, Google. 【Extreme Stability】 Upgraded air vent clip with silicon padding makes the charger stable on the air vent and keeps your phone secure. 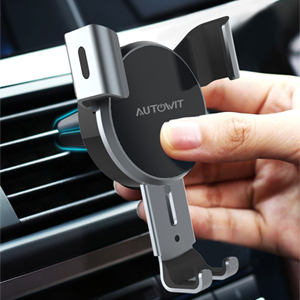 【Convenient driving】 Adjustable vent clip enables flexible viewing angles to keep your phone in sight for navigating while driving. The best way to keep your phone in view while keeping your hands on the wheel and your eyes on the road. 1. Holding your phone securely while charging in the car. 6. Using a QC 3.0 car charger adapter(INCLUDE) provides more amps to this wireless charger. 7.If your phone covered with a case, please make sure it will not block wireless charging function.